Ahipara Tides is Absolute Beachfront on 90 Mile Beach, Ahipara. All the amenities are provided to make your stay enjoyable. Perfect for two but sleeps three comfortably. We are the only accommodation in Ahipara that offers a Spa Pool for your enjoyment (private on request). 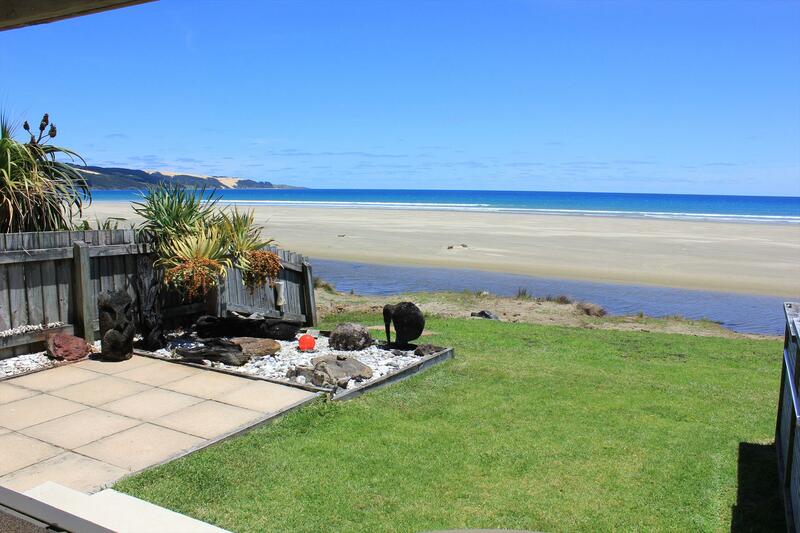 Our high quality well-appointed apartment has awesome unlimited views of Ninety Mile Beach, South to Shipwreck Bay & Tauroa Point and North to Mt Camel & the Bluff. Free Wireless Broadband. On offer are fishing, diving, surfing, horse trekking, swimming, kayaking, collecting Tuatuas (clams) & more, or just go for a leisurely stroll along the beach. It is only a 5-10 minute easy walk to local shops, takeaways, cafe & golf club. Enjoy a BBQ breakfast, lunch or dinner on your private covered deck. Board games & cards provided. Sports & beach gear include beach chairs & towels, one person sit on kayak, dingy, boogie boards, chilly bin & more. Out front, the Wairoa Stream meanders along Ninety Mile Beach out to sea. Take the kayak and have a leisurely paddle up the Wairoa Stream. Ahipara Tides is a great place to sit back and unwind. We only have one unit available so you can be assured of your privacy and a peaceful relaxing stay. We stay in the adjacent unit and are always available should you require any assistance. Cape Reinga Tours Arranged. They pick you up here..
Ahipara Tides is Absolute Beachfront on 90 Mile Beach, Ahipara. All the amenities are provided to make your stay enjoyable. Perfect for two but sleeps . . . More . . .